Most of ginger health benefits and effects are largely due to its active constituents: gingerols, shogaols, and zingerones. These compounds have been found to aid in easing digestive issues and combating inflammation, therefore making ginger an excellent, all-natural home remedy for many common ailments. However, there are also some ginger side effects and cautions that you should take into consideration. Motion sickness. Many healthcare professionals recommend ginger for treating and preventing nausea from motion sickness, as well as from altitude sickness. 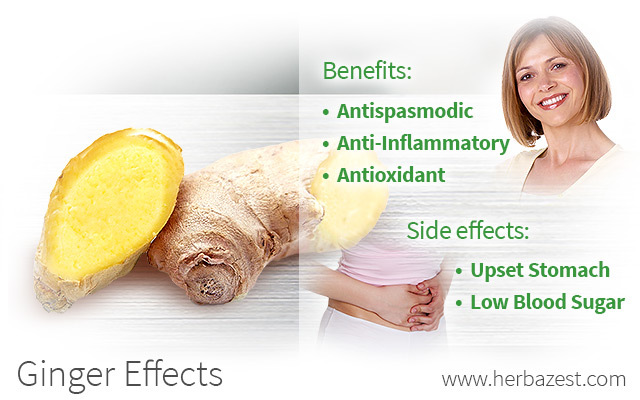 Ginger has been found to be more effective than dimenhydrinate or placebo in treating nausea. Pregnancy nausea and vomiting. Studies have shown that women who ingest ginger in early pregnancy experience less nausea and vomiting. However, women who are pregnant should not take more than one gram a day, and only for short periods (no longer than four days). Chemotherapy nausea. Current research suggests that ginger is useful in reducing the duration and severity of nausea experienced by patients during chemotherapy. Dyspepsia. Ginger's effects against dyspepsia (heartburn and indigestion, often accompanied by nausea and vomiting) are due to its high levels of gingerols, which have anti-ulcer and cholagogue effects. Headaches and migraines. Ginger's anti-inflammatory effects have contributed to the relief of headache and migraine pain. Joint inflammation. Studies have shown that a purified and standardized ginger extract is highly effective in reducing the pain and symptoms associated with osteoarthritis of the knee. Ginger acts as a powerful antioxidant and has been shown to be effective in reducing oxidative stress caused by free radicals in the environment. The phytochemistry of ginger's compounds allows them to find and deactivate free radicals in the body, therefore helping prevent many serious diseases. Adults should not consume more than four grams of ginger per day in any form, and pregnant women should not take more than one gram of ginger per day. Before taking ginger for medicinal purposes you should always consult to your doctor. While taking this Asian root reports many health benefits, ginger supplements should be taken with caution. Though it is rare to experience side effects from taking ginger, when consumed in high doses, it may cause stomach discomfort, which may include symptoms such as heartburn, diarrhea, upset stomach, or mouth irritation. There is a possibility that ginger may lower blood pressure. For that reason, do not take ginger in combination with high blood pressure medications. In addition, ginger may increase the risk of bleeding and shouldn't be taken with blood-thinning medications. Ginger may also lower blood sugar and can increase the risk of developing hypoglycemia or low blood sugar in patients being treated for diabetes. If you are unsure about the possible effects of ginger, be sure to consult your doctor. Most of ginger's health benefits have been validated by scientific studies, as well as by popular use since ancient times. As a natural herb, ginger is great for being used in treating inflammation and nausea, as well as for preventing many diseases.